If you spend a lot of time in the car for business reasons, then you’re probably familiar with (and at least mildly annoyed by) the need to track your mileage for tax purposes. This used to require an arduous and painstaking process of logging your information in some sort of notebook (or, for the less organized, discarded receipts, envelope backs, and scrap paper) so that when tax time rolls around, you can enter all that information into your return. Even if technology can’t necessarily do something about the painstaking part of the process, it can help somewhat with the arduous part. App Cubby’s Trip Cubby software lets you track your billable miles right on your iPhone and it does so in a clean, friendly interface that’s easy to use, even if there are a few quirks here and there. Launching Trip Cubby will present you with a list of your logged trips, including the purpose, destination, date, mileage, and whether they were for paid or unpaid reasons. At the bottom of the screen there’s a button labeled with an eye that lets you sort by different criteria, such as date, distance, or alphabetical order. Tapping any of the logged trips will provide you with a nice little summary screen of the trip in question. From there you can tap the edit button in the top right to change any details if necessary. Adding a trip is as easy as hitting the "add trip" button on the main screen, denoted with a "+". Trip Cubby’s entry screen is exceptionally detailed, with fields for pretty much every purpose, but one of the downsides is that tapping on any of the fields necessitates loading a separate screen for actually entering the data. This makes the process somewhat tedious as you fill out all the details—fortunately, Trip Cubby does allow you to create “frequent trip” templates that you can use to pre-load details for repeated trips. Number puncher: One of Trip Cubby's best features is the option to enter numerical data, such as mileage, on a convenient number pad. While Trip Cubby by default uses the iPhone's spinning dials selectors to enter mileage and other numerical information, there’s a setting that allows you to switch that to a standard number pad interface, which vastly speeds the entry process. Unfortunately, that setting is squirreled away in the Trip Cubby section of the iPhone’s Settings application, meaning many users may not find it (this isn’t really App Cubby’s fault, though, as it’s the way that Apple asks developers to implement these kind of preferences). Trip Cubby also gives you options for how you want to compute distance. When you create a new entry, it automatically loads your last trip’s ending odometer mileage as the starting mileage, so as long as you’re consistent about tracking everything, you just have to enter either the distance or the ending odometer reading, and it will calculate the other value for you. Should you want to pull up specific records, there is a search field that you can access from the main screen by tapping the magnifying glass icon. As you type into that field, Trip Cubby will filter records based on matches from the name and destination fields. More powerful search options are available by tapping the “More” button, which lets you additionally search by tag, type of trip, driver, vehicle, odometer range, and certain time periods (last month, last week, etc.). 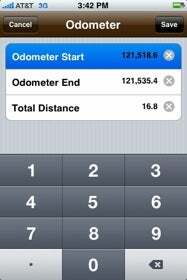 Of course, having reports of your mileage on your iPhone is only half the battle: you’ll want to be able to get them onto your computer too. Trip Cubby can send reports via e-mail, but the function isn’t obvious; you’ll need to tap that magnifying glass icon to bring up the search interface before the “add trip” button changes magically into an "e-mail" button. This is because the report mailing feature can be used with the search feature: for example, if you enter search criteria and then send a report, you’ll only get a report containing those results you filtered for. Trip Cubby sends the report in a nicely formatted, easy-to-read e-mail, and thoughtfully includes a CSV file that you can import into most spreadsheet programs. I do, however, have a few other gripes about the e-mail interface. For example, the To field doesn’t auto-complete addresses, like the iPhone’s Mail app, although it does let you pick an address from your iPhone's contact database by tapping the blue plus icon. You can only send a report to one address, so you’ll need to forward it from there if you want to send it to others. And e-mails from Trip Cubby originate not from your own e-mail address, but from reports@tripcubby.com, causing at least one report to get caught in my spam filter (the developers inform me that this is because Apple doesn't allow third-party developers to send attachments via the built-in Mail interface). Overall, Trip Cubby is an excellent program that manages to marry most all the features that a dedicated mileage tracker might want with an interface that is friendlier, and yes, prettier, than many of its competitors. However, there are still some quirks and decisions that can be opaque to new users, and it could especially benefit from a more streamlined data entry process.